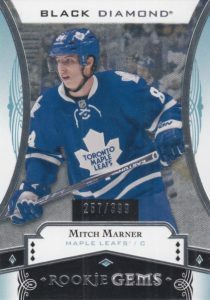 2016-17 Upper Deck Black Diamond Hockey maintains its spot in the high-end hobby realm, continuing the brand's shift from last year. Each hobby box contains five cards plus a bonus one-card Exquisite pack. 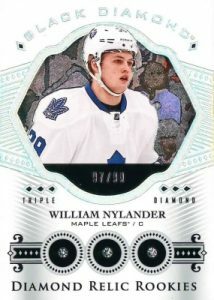 While not the biggest draw in 2016-17 Upper Deck Black Diamond, base collectors have a 50-card set to chase along with multiple limited parallels. Among these are Pure Black (#/99), Pure Black Signatures (#'d), Relics (#/149 or #/49) and Pure Black Prime Relics (#'d). Adding to the main set are the popular Diamond Relic Rookie Gems (#/99) that come as Single Diamond, Double Diamond, Triple Diamond or Quad Diamond versions for top incoming rookies. 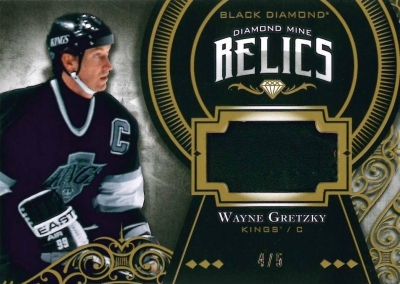 Mario Lemieux is given the Rookie Retro treatment with his own quad diamond card (#/66). Covering the rookies with added rarity, Pure Black (1/1) parallels are some of the toughest pulls in the product. More first-year players can be found in Rookie Gems (#/399) that are also issued as Pure Black (#/25) and Pure Black Signatures (Tier 1 - #/199, Tier 2 - #/99). Featuring multiple relics types, Signature Rookie Materials contain either Jersey (#/99), Patch (#/25), Stick (#/15) or Glove (#/10) swatches. Meanwhile, Rookie Booklet Relics offer a base version, numbered to 299, as well as Autograph Jersey (#/49) and Autograph Patch (#/10) parallels. Highlighting both incoming players and more seasoned stars, Silver on Black Signatures (#/d) and Silver on Black Rookie Signatures (Tier 1 - #/125, Tier 2 - #/49) are in play with a distinct color combo. 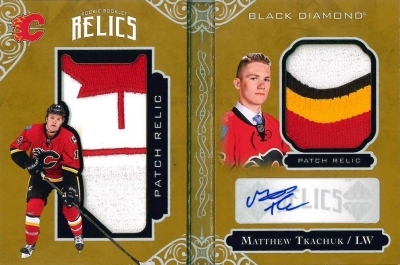 Fixating on title winners, 2016-17 Upper Deck Black Diamond Hockey looks to the champions with Championship Banners (#'d) and Gold Autographs (#'d). Championship Rings average 1:5 packs and also have a Gold parallel (#/5). 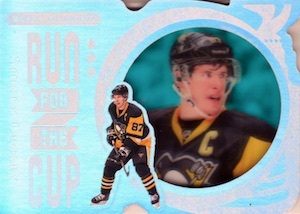 Run for the Cup Silver is limited to 99 copies and there is a 1/1 Gold parallel, as well. Combining to form one huge team logo, 2016-17 Upper Deck Black Diamond contains both Rookie Team Logo Jumbo Patches (1:3 packs) and Rookie Team Logo Jumbo Patches SP (1:45 packs) as well as veteran Team Logo Jumbos (1:5 packs) and Team Logo Jumbos SP (1:720 packs). There are also Gold (hand #/15), Alternate Logo (hand #/5), and NHL Shield Logo (1/1) parallels. 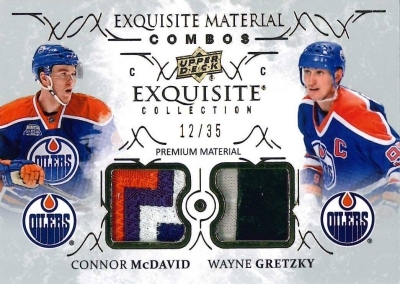 Lastly, Exquisite Collection closes out 2016-17 Upper Deck Black Diamond Hockey with the first batch of cards for the brand that will be spread across select 2016-17 products. Every box includes one pack that will hold a single Exquisite card from a large list of options. 2016-17 Black Diamond Tyler Seguin Run For The Cup Die-Cut 49 99! 50 cards. Serial Numbered #/249. PARALLEL CARDS: Pure Black Relics #/149 or #/49, Pure Black #/99 or #/25 (some are signed), Pure Black Prime Relics #/50 or less. Not all subjects found in each parallel. View specific options with the full spreadsheet. PARALLEL CARDS: Pure Black 1/1. 50 cards. Serial Numbered #/5. 1 card. Serial Numbered #/66. PARALLEL CARDS: Gold Autograph #/99 or less (*No card #MS). PARALLEL CARDS: Autograph Jersey #/49, Autograph Patch #/10 (*Card #AM - #/5). 18 cards. Serial Numbered #/399. PARALLEL CARDS: Pure Black Signatures #/199 or less, Pure Black #/25. 30 cards. Serial Numbered #/99. 24 cards. Overall odds 1:5 packs. 54 cards. 1:5 packs. *Short Prints - 1:720 packs. 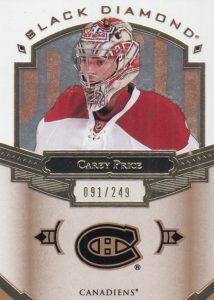 PARALLEL CARDS: Gold #/15, Gold Alternate Team Logo #/5, Gold NHL Shield Logo 1/1. 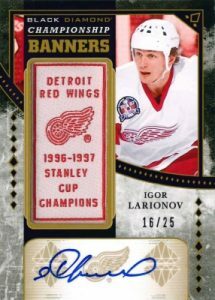 PARALLEL CARDS: Autograph Alternate Logo #/25, Autograph NHL Shield Logo #/5. Found in Exquisite Collection bonus packs included in 2016-17 Black Diamond boxes. 21 cards. Serial Numbered #/149. 15 cards. Serial Numbered #/35. 6 cards. Serial Numbered #/25. 9 cards. Serial Numbered #/199. PARALLEL CARDS: Spectrum #/20 or less. PARALLEL CARDS: Spectrum #/25 or #/10. PARALLEL CARDS: Shield Spectrum 1/1. PARALLEL CARDS: Spectrum #/10 (*Card #RD-AM - #/5). PARALLEL CARDS: Spectrum #/5 (*Card #RQ-AM - #/3). Shop for 2016-17 Upper Deck Black Diamond Hockey boxes on eBay. Wish they had gone back to the old Black Diamond. 1. After all the complaints from last year, they kept the Manufactured Patches and Team Logos. For God’s sake, this is a High-End product and manufactured patches have no place here. 2. And again, stickers auto in a High-End product. Really? 3. UD announced 1 Diamond card per inner, which doesn’t mean you’ll necessarily get a Rookie Diamond Relic. You can also end up with a Base Diamond Relic, with a Henrique or a Gibson for example…Also, I’m not sure if Mine Diamond Relics are counted as a Diamond Relic. You give Matheson a Signature Rookie Materials card but no Rookie Gems. Just doesn’t make sense. Btw, Team Canada thought enough of him to include him in the World Championships team with NHLers. Also plays a regular shift for a Rookie. What does it mean when they say (hand #\5) what does hAnd stand for? It means the individual print run numbering is written by hand instead of being machine stamped. Where do you see that on this checklist? Am I mistaken…..NO TEEMU??? And I was so looking forward to the next Teemu/Jets Auto. Nice looking cards, some rare sp rookies. Sure wish the price was under $200. Yikes! Hope every box has a Matthews or Laine. Not only did they include the manufactured patches set, they quadrupled the amount of these worthless cards. One quad gem rookie, are you kidding me? $300 plus a pack again, barf! Great potential here but as always odds are stacked against you. $275 canadian a pack is a lot for 6 cards. I don’t know why people say this so often. The problem is in the value. 6 cards is fine if they’re good cards for $275. Sadly, the chances are good that most of them will end up being worthless. I think box prices are just too high. As another blogger said, there is potential here, but there are too many small flows and the product ends up to be mediocre. Despite the fact that I got crazy lucky and I did extremely well, I will still rate this product 2 stars. 1. White cloths presented as patches again, and again, and again. No wonder they can produce so many Patch cards when half of them are…well…not patches. 2. Quality Control continues to be the biggest issue for me. In EVERY SINGLE High End case I break I find at least 2-3 damaged cards. And I don’t know how this happens but the damaged cards are never those jersey #/299 that hold 0 value, but the most important cards in the set. 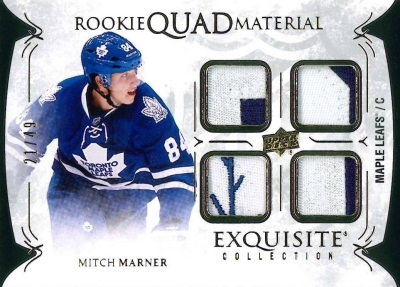 Just take a look at Matthews Signature Rookie Materials low numbered patches on eBay. All have a lot of whitening around the corners and edges. I’m not even talking about those smashed corners or half missing signatures. 3. As I said before, manufactured patches are good for a low end product, NOT for a High End. It’s like buying a Porsche with no air conditioning, but a fan instead. 4. Autos on stickers, again an insult to High-End collectors. 5. Diamond Mine Relics seems a bit redundant and I don’t see it’s place in the collection, as well as making two different sets: Placards and Silver on Black. The two are almost identical. 1. I like the Exquisite series. Some nice cards, especially the design of the Draft Day set. 2.The diamonds idea is sweet and the fact that there are 4 Rookie Diamond Relics levels is even better. 3. The base cards are nice and I love the design of the Pure Black ones, especially when you hit a nice patch. The contrast between the colours and the shiny black is marvellous. 4. I also like the Rookie Gems set. It’s a cheaper variant for those who cannot afford the Diamond Relics set. You can still have a Matthews or a Laine for a lower price. 5. The Road to the Cup is a nice addition. I like the die cut, acetate, and foil combination. i saw many 15-16 tins of THE CUP cracked.this product is better!! and LESS THAN 1/2 the price ! Great product! Cards look great and are good quality. I agree that they seem better than the cup and all the other high end products that have been put out lately. Highly recommend, reasonably priced in the states. After seeing a lot wax breaks it appears most if not all ROOKIE GEMS even Autographs cards are damaged top left corners. So if returned to upper deck you will get a replacement of some other BRAND card and not the same, thus a lot of these cards will be destroyed as upper deck says it does with damaged cards so these cards would be much less around. On an other note buying a box for $290 is a loss before you even open the box. Prices are over inflated on all wax boxes, all you have to do is go back to 2005/06 CROSBY ROOKIE and the wax boxes were half the price cost when they first came out compare to last years and this years product. Some will say look you get more rookies and autos and jersey. Jersey and auto now a days come out from boxes by the boat load and most are found on ebay for bargains under10.00 so why would you pay 300.00 for a box to end up with 6 10.00 cards. Seems the sport cards hobby has turned into a gambling addiction as now your buying a team or a random to get a McDavid-Mathew so you can flip it on flleebay. Another product that is over rated, too expensive, sticker autos, horrible inserts and bottom line UPD gives no s*** because they now own the rights to do whatever they want. This is supposed to be a high end product with manufactured patches and stickers….garbage garbage garbage. I really like the Exquisite Collection. For the most part, they are nice looking cards and, IF it was possible, I would prefer a box of them to the BD. I assume UD would exploit them as well if they were sold as a stand alone product. Upper Deck, read these honest comments from REAL COLLECTORS and rectify one of your “high end” products that could be really great. 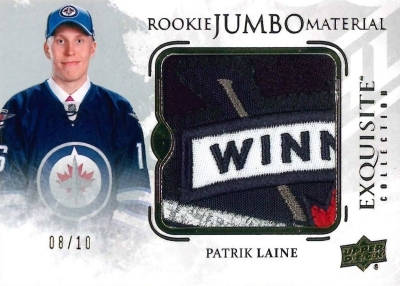 Is that card of Patrik Laine sold in eBay really 1 of 1?? Condition doesn’t look mint but it would still be a nice piece!